Microelectromechanical system (MEMS) pressure sensors have changed the way that system designers and application engineers measure pressure. The simplicity of use, small size, low cost and ruggedness allow these sensors to address applications in automobiles and industrial process control as well as medical and handheld portable products. For example, a highly accurate altitude measurement in a handheld navigation device such as a smartphone that has three-axis accelerometers, gyroscope and magnetometers adds a tenth degree of freedom. Pressure sensing allows the navigation device to locate the exact floor of a destination. Figure 1. Gage, absolute and differential pressure measurements have different types of pressure on each side of the diaphragm. In these designs, the diaphragm is etched from silicon using micromachining, a chemical etching process. The measurement technique can involve capacitive or resistive (piezoresistive or pressure sensitive resistors). Piezoresistive designs are shown in Figure 1. Vacuum is a negative gauge pressure or a value below atmospheric pressure. When specifying or discussing the type of pressure measurement, it is essential to identify the type of measurement to convey an accurate description of the measurement technique. 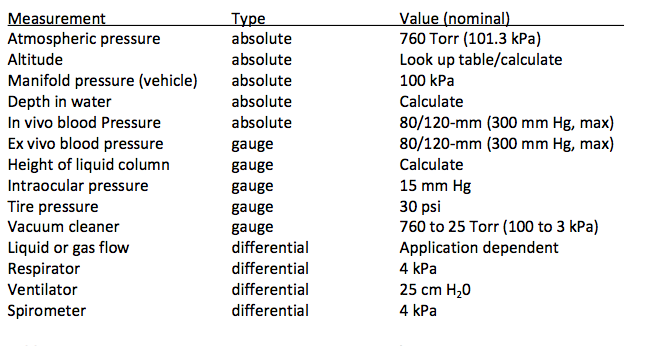 Table 1 shows the sensor requirements for several common measurements. Table 1. Common pressure measurement versus type of measurement. Perhaps the most fundamental pressure measurement is atmospheric pressure. Standard atmospheric pressure at sea level is 29.92 inches of mercury (Hg) (760 mm Hg (Torr) or 14.696 psi). The atmospheric pressure decreases with increasing altitude and increases at altitudes below sea level. Weather patterns with low and high fronts decrease or increase atmospheric pressure. An aneroid barometer provides an absolute pressure measurement. The pressure on submerged bodies increases based on the density of the liquid and depth in the liquid according to Eq. 2. Common measurements include depth in fresh or salt water. For fresh water, pressure increases 0.43 psi per foot and in salt water it is 0.44 psi per foot. A scuba diver’s submersible pressure gauge (SPG) or depth gauge makes an absolute pressure reading. A dive computer provides the time required for a safe ascent, since even a depth of 100 feet can produce a pressure of 400 kPa (3.951 atmospheres, or 58.1 psi). Figure 2. 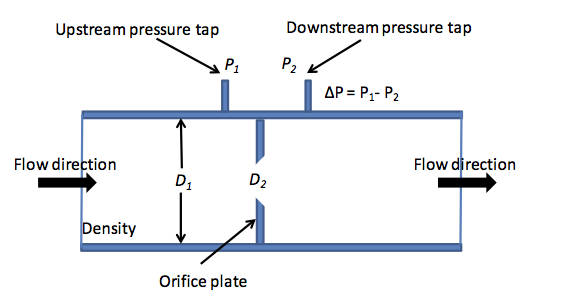 Elements of a ΔP flow measurement.